The causes of disease and ill health can be grouped as follows: Infection disease, non infection disease and social causes. Mckeown in his thesis states that the continuous increases in population and dramatic improvement in health of human in the past centuries are as a result of changes in economics and social condition rather than to specific medical advancement or public health initiatives. Health affects the social condition in which people find themselves. Poor social and economic conditions affect health throughout life and increase the risk of ill health and diseases. Dahlgren and Whitehead (1991) talk of the layers of influence on health. They describe a social ecological theory to health. They attempt to map the relationship between the individual, their environment and disease. Individuals are at the centre with a set of fixed genes. Surrounding them are influences on health that can be modified. The first layer is personal behavior and ways of living that can promote or damage health. –e.g. choice to smoke or not-Individuals are affected by friendship patterns and the norms of their community. The next layer is social and community influences, which provide mutual support for members of the community in unfavorable conditions. But they can also provide no support or have a negative effect. The third layer includes structural factors: housing, working conditions, access to services and provision of essential facilities. For example when a population develops the tendencies to avoid diseases and death in a less privileged community is shaped by resources available such as knowledge, money, power, prestige as well as beneficial social connections. People with these resources will be able to gain a health advantage to a greater extent than people who are less privileged in the society. Social class directly shape individual health behavior by influencing what people know about, have access to, can afford and are supported in their quest for health enhancing behavior. Social class also determined types of neighborhoods, occupations and social network. 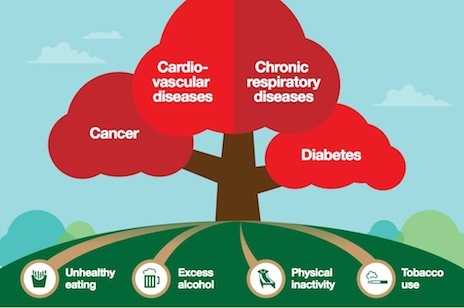 WHO in 2003 lists social determinant of health as: the social gradient, stress, early life, social exclusion, work, unemployment, social support, addiction, food and transport. The social condition of individual determined the health outcome of that individual. Social condition achieve this status not because they are independent from other social factors but rather because they shape the distribution of the health enhancing circumstances that health directed human agency provides. Parson (1978) identify six stages of social process of becoming ill as social processes and vulnerability, development of symptoms, symptoms interpreted as illness, a decision is made to seek health care, applying an illness label – the doctor/patient interaction, morbidity statistics shape our view of disease. Putman (2000) then said social network help people to stay healthy, if someone belong to no groups but decide to join one, that person has cut the risk of dying over the next year in half. This article has shown that people at the bottom of social ladder are more likely to suffer more from disease and illness than those at the top of social ladder. Cockerham, C. William (2007) Social causes of Health and Disease. Cambridge: Polity Press. Dahlgren and Whitehead (1991) Health Promotion Theoretical Framework. McKeown, T. (1976) The Role of medicine. Oxford: Butterworth-Heinemann. Moon, G. and Gillespie, R. (1995) Society and health. London: Routledge. Nettleton, S. and Gustafsson, U. (2002) The Sociology of Health and Illness. Oxford: Blackwell Publishers Ltd.
Parsons, T. (1978) Action Theory and Human condition. New York: Basic Press. Putnam, D. Robert (2000) Bowling Alone: The Collapse and Revival of American Community. New York: Simon and Schuster.